Joel Passante of MPMM productions was awesome enough to volunteer to record our Multiplayer Madness CD release party back in August. Out of a work of love, he has edited it all together to make us look awesome and created a DVD of the show. We've put an excerpt of it up on YouTube that you can view from our media page. There will be more as we decide which tracks came out the best! All of us want to send a big Ten Too Many thank you to Joel for putting this together! After almost seven years of playing together, Ten Too Many has stopped gigging. Between the workload of school and having band members living across the country, it was no longer feasible to sustain a ten person group. 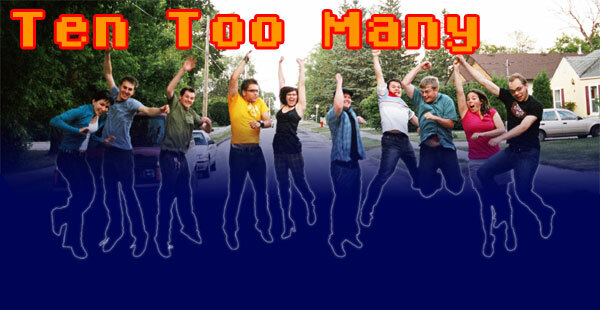 After one last awesome show on New Year's Eve, Ten Too Many is on permanent hiatus. 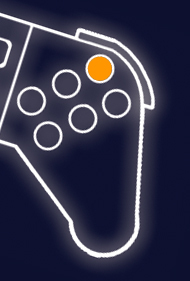 The website will stay up to date, and there will be plenty of new content that will go up in the near future. You can always email us if you've got something to add. Our CDs are still available to order and you can download some of our tracks here. Thank you to everyone who has contributed to so many good years and so many great shows! Poster for the New Dylan's show on December 9th. See it here first! 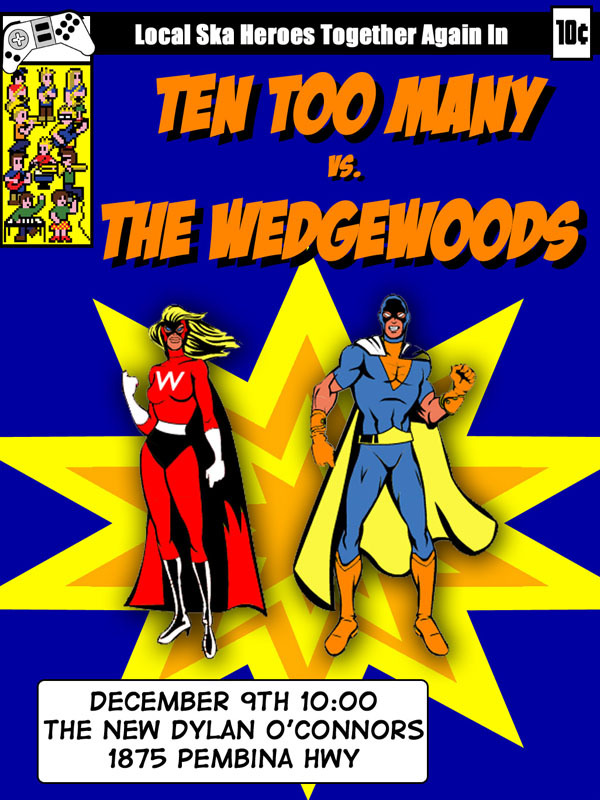 Catch Ten Too Many and The Wedgewoods at The New Dylan O'Connor's on Pembina. Details on our dates page. We also seem to have a fairly impressive Wikipedia article. Thanks to fans and friends who have taken the time to contribute! Anyone who feels inspired or has something to add is encouraged to go and edit the article. A couple more shows confirmed. We're playing at The Pyramid for Mod Night on November 16th. We've also got the final details for the show on New Year's. We're playing at Dylan's Irish Pub with The Dust Rhinos. Eliot has moved to Montreal to do his master's. This makes things a little harder for Ten Too Many, being that he happens to play a fairly important instrument and all. But, after some careful consideration and assessment, this is far from the end for us. Montreal isn't far away and Eliot will be in the city for various things and will be able to continue to perform with us. That means that we have NEW SHOWS coming up! Keep checking the site and watching the dates page. We've also put up pictures from some recent events including the CD release. You know where to find them. Thank you to everyone who came out to our CD release! We hope that you had as much fun as we did. We've got our new album for sale on the discography page, and a couple downloads if you just want to listen. We'll post photos as soon as we collect them. Thanks to Joel Passante for filming our whole show! We look forward to seeing how it turns out. The CD release time has changed to doors at 8:00 and bands at 9:00. Sorry for the change! All of our lyrics from both CDs are up on the discography page. Free music you say? Sneak peek at the new album you say? 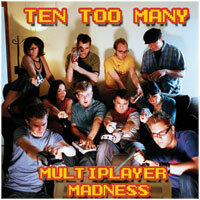 Download two tracks from our new album Multiplayer Madness on our discography page. As you can see, we're finally doing a long-needed update of our website. There are a few things that aren't quite finished yet, but they'll be finished up in the next week (I guess you could say it's still in Beta). Thanks to Garrett Samm for doing most of the design for us. Feedback or comments are always appreciated! We're releasing our second full length album! August 19th at The Pyramid Cabaret. We're still finalizing the details so keep an eye out here! Details about the War Child benefit show at the Elice Cafe & Theater on August 11th have surfaced. We've cleverly hidden them here.